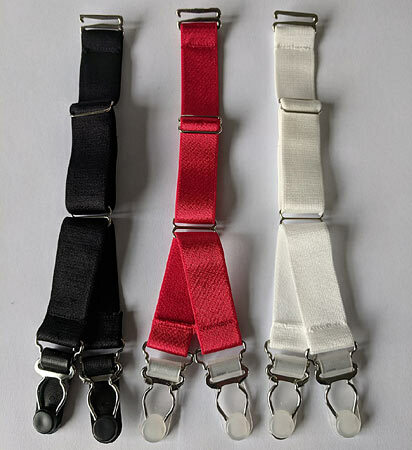 Replacement suspender straps perfect to attach to your favourite retro suspender belt and increase the total number of straps to secure your stockings. If you have an existing belt with 8 straps, using these Y clips all around can increase it to 16. Alternatively, you could change the front 2 clips only giving the extra support of a 10 strap belt. These straps can also be used as spares or to replace any that have worn. Metal clips, 15mm wide elastic strap and fully adjustable.